The matriarch of the troop, Sedona has mothered all the lemurs in Lemurland with her mate, Verde. Her favorite foods are blueberries, grapes, and bananas. 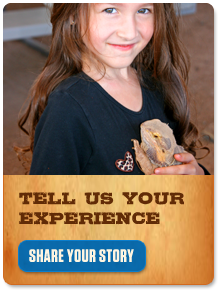 Born in 2000, Sedona made Out of Africa Wildlife Park her home in November 2001. One year later, Verde arrived at the park and they have been mates ever since. Sedona gives birth every spring, and their offspring have stayed with the family. Her husband, Verde, is submissive to her, as is customary in lemur society. Sedona keeps a watchful eye on the pups. Lemurs enjoy watching us as much as we love to watch them, making them one of the most intriguing and entertaining mammals to observe at the park. The ring-tailed lemur lives in Madagascar, an island country located in the Indian Ocean off the southeastern coast of Africa. Madagascar is a biodiversity hotspot where over 90% of its wildlife is found nowhere else on Earth. This condition exists because Madagascar split from India millions of years ago, allowing plants and animals on the island to evolve in complete isolation. Found only in Southern and Southwestern Madagascar, the ring-tailed lemur ranges further into highland areas than other lemurs. It inhabits deciduous forests, dry scrub, montane humid forests, and forests along riverbanks. It strongly favors gallery forests, but such forests have now been cleared from much of Madagascar in order to create pasture for livestock. Depending on location, temperatures within its geographic range can vary from 10° F to 118° F.
The ring-tailed lemur is a relatively large lemur. Its average weight is 5 pounds, with a total length of 37 to 43 in. The tail length is 22 to 25 inches, making the tail longer than the body. The tail, the ring-tailed lemur’s trademark, is not prehensile. Instead, it is used for balance, communication, and group cohesion. Tails are ringed with 13 to 14 black and 12 to 13 white bands, and always a black tip. The breeding season runs from mid-April to mid-May. Estrus lasts 4 to 6 hours and females mate with multiple males during this period. Within a lemur group, known as a troop, females stagger their receptivity so that each female comes into season on a different day during the breeding season, reducing competition for male attention. Gestation lasts for about 135 days. In the wild, one offspring is the norm, although twins may occur. Ring-tailed lemur infants have a birth weight of 2.5 ounces and are carried on the chest for the first 1 to 2 weeks, then on the back. 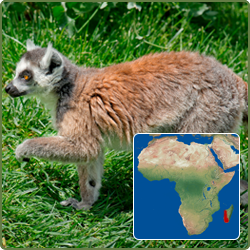 The young lemurs begin to eat solid food after 2 months and are fully weaned after 5 months. Sexual maturity is reached between 2 ½ and 3 years. Infant mortality can be as high as 50% within the first year, and as few as 30% may reach adulthood, due to harsh environmental conditions, predation, and accidents such as falls. Ring-tailed lemurs live 15 to 18 years in the wild, and in captivity the lifespan climbs up to 20 to 25 years with proper care. The ring-tailed lemur is diurnal, meaning they are active exclusively in daylight hours. Ring-tailed lemurs live in groups, called troops. These troops may include 6 to 30 animals, but average about 17. Both sexes live in troops, but a dominant female presides over all. Ring-tailed lemurs are the most terrestrial of all lemurs, but they spend time in all layers of the forest. They move by walking or running on all four limbs, holding their tails almost completely vertical as they move, with the tip of the long tail curving away from the body forming the shape of a question mark. Male lemurs use their antebrachial and brachial glands to demarcate territories and maintain intra-group dominance hierarchies. The thorny spur that overlays the antebrachial gland on each wrist is scraped against tree trunks to create grooves anointed with their scent. This is known as spur-marking. In displays of aggression, males engage in a social display behavior called stink fighting, which involves impregnating their tails with secretions from the antebrachial and brachial glands and waving the scented tail at male rivals. The ring-tailed lemur is an opportunistic omnivore primarily eating fruits and leaves, particularly those of the tamarind tree. When available, tamarind makes up as much as 50% of the diet, especially during the dry, winter season. The ring-tailed lemur eats from as many as 3 dozen different plant species, and its diet includes flowers, herbs, bark, and sap. It has been observed eating decayed wood, earth, spider webs, insect cocoons, arthropods (spiders, caterpillars, cicadas and grasshoppers), and small vertebrates (birds and chameleons). During the dry season it becomes increasingly opportunistic. The maximum lifespan reported in captivity was 27 years. Females have two pairs of mammary glands, but only one pair becomes functional. The ring-tailed lemur will sit facing the sun to warm itself in the mornings. Ring-tailed lemurs are some of the most vocal primates. Ring-tailed lemurs were introduced to the United States on St. Catherine’s Island, Georgia as part of a project to establish a free-ranging, breeding population that could be studied and in the future could potentially serve as a source to restock parks in Madagascar. Several factors threaten ring-tailed lemurs today. First and foremost, Madagascar’s diverse ecosystems and unique wildlife are threatened by human settlement and habitat destruction. It is estimated that 90% of Madagascar’s original forest cover has been lost. Also, periodic drought common to southern Madagascar can impact populations already in decline, particularly for females and the young. Fires from the clearing of grasslands, as well as slash-and-burn agriculture, destroy forest acreage as well. The Convention on International Trade in Endangered Species of Wild Fauna and Flora (CITES) appendix lists the ring-tailed lemur species as near threatened.